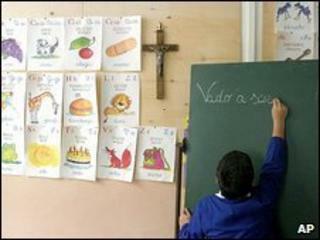 The Italian government is appealing to the European court of human rights to overturn a ban on classroom crucifixes. This case against crucifixes was brought by a woman who argued that her children had a right to a secular education under Italy's constitution. Last year the court agreed with the mother, saying parents should be able to bring up children as they saw fit. Her victory caused uproar in Italy, where 90% of the population describe themselves as Christian. Italy will start its appeal against the court's ruling - which was widely interpreted as interference in the country's culture, history and religion - on Wednesday. If the government loses, it would mean that all religious artefacts in classrooms across the European Union could be outlawed. The Vatican has already said that the European court has no right intervening in such a profoundly Italian matter, says the BBC's Duncan Kennedy in Rome. It accused the court of wanting to ignore the role of Christianity in forming Europe's identity. A government minister said the ruling was "shameful", while Education Minister Mariastella Gelmini said the crucifix was a "symbol of our tradition", and not a mark of Catholicism. The law requiring crucifixes to be hung in schools dates back to the 1920s and was never repealed. But the role of Catholicism as the state religion ended in 1984, when the official link between the Vatican and the Italian government ended.